Alice in Wonderland is one of my favorite childhood stories; I also love the Disney animated movie and enjoyed Tim Burton’s twist on the story back in 2010. I’ve always identified with the character the Cheshire Cat – that famous big, wide grin and his confusing philosophical ways. The Cheshire Cat sees and knows a lot of things, yet keeps it all concealed behind his grin – innocent, yet guilty grin I might add. Another favorite of mine is The Matrix. There are so many similarities between the two stories, the obvious one being a journey into a world the characters never thought existed, thus tearing their illusion of reality in two. They are stories of duality. Neo received a message to “Follow the white rabbit.”, which ends up being a white rabbit tattoo on a girl. This starts Neo on his journey to find the truth and to meet Morpheus, who, in my opinion, represents the Mad Hatter. Morpheus uses direct allusion to Alice in Wonderland when he and Neo finally meet and start talking – “I imagine that right now you’re feeling a bit like Alice, tumbling down the rabbit hole.” He does it once again when presenting Neo with the option of finding out the truth and introducing him to the Matrix itself; he gives him the choice of the blue or red pill – the red pill that will tumble him down the rabbit hole. 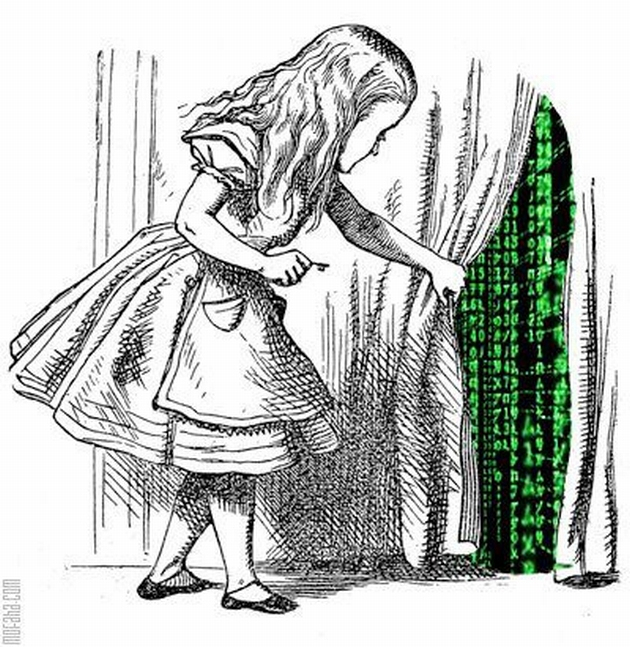 There are so many other references to Alice in Wonderland in The Matrix, but I will leave that to you to go seek them out. We all have choices in life and come across a fork in the road on occasion. Do I take the blue pill and keep walking the path I’ve become accustomed to, or do I chance it, take the red pill and see just how deep the rabbit hole goes? I’ve taken the red pill more times in my life than I’d like to admit. I’m a risk taker. I jump off proverbial cliffs. I fall. I make mistakes. I always manage to get back up, dust myself off and move forward, even if I can’t see the path in front of me. I live for adventure and view every single day as a chance at a new adventure. Sometimes I end up on the path I’ve walked a million times before, but I also find that familiar path surprisingly leading me into the unknown on occasion. I make sure that I pay attention to all the signs along my path, including the detours and warnings. My own personal sign for the past few years has read Caution: Under Construction, but thankfully, that has finally come to an end and I’m open for travel and adventure again. I’m always excited, yet a bit cautious, when faced with a path that is more on the dark and mysterious side. I have come to believe that I am naturally drawn to these choices and circumstances in life. Being drawn to and attracting unconventional choices in life is part and parcel of being an artist and a writer. I believe it makes our lives a true Wonderland. I fully embrace opportunities that bring me closer to Wonderland – if anything I know the experiences will fuel the creative fires and offer me new artistic material. Each and every time I venture deeper down the rabbit hole; most of the time I make this journey alone, on very rare occasions I am lucky enough to have a companion. I have been known to dive into the rabbit hole head first, with no thought or planning. Whether I dive or crawl in slowly, I know I want to experience and indulge in every single sight, sound, taste and touch. I want the full experience. I’m not a tourist, I’m a traveler. This proverbial Wonderland is different for each of us; it is rare delight when you can find that one person ready, willing and able to embark on the journey with you. Perhaps they’ve even been there before and can show you things you could only imagine, and vise versa; one is never too old to learn. So when you come to that rabbit hole, which will it be? The blue pill of redundancy and familiarity or the red pill of adventure, excitement and a world of possibilities? For me, red pill every single time.